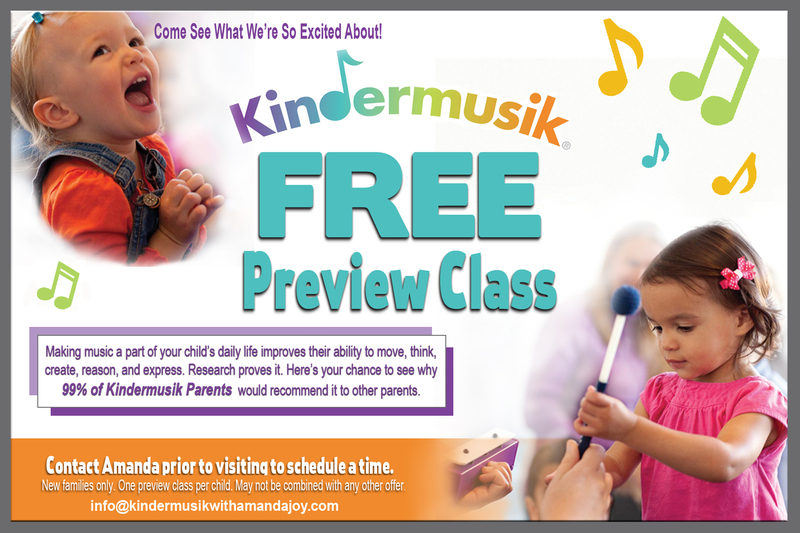 Available to all families who are new to the Kindermusik program. Take advantage of our referral discount program; refer your friends and receive 10% off your tuition for each new student enrolled….refer 6 new students for any given session and YOUR TUITION IS FREE!!! – “Sibling Packages” of Home Materials are available upon request. 10% off tuition for each newly-enrolled student you have referred….refer 6 new students during a single session & your TUITION IS FREE!!! While each 8 – 10 week session has it’s own curriculum, the program is not structured sequentially (one session is not necessarily built on the skills learned in the previous one); therefore, new students have the option of joining a class that is already in session in which case tuition will be pro-rated.